There are 10 basic steps that will help you get your Car Wash project from dream-state to off the ground and running. Before we get into the steps, it’s good to get a grasp on what some of your car wash business options are. Scout and find different locations. You need to take the proximity of each location in relation to residential neighborhoods and you need to know the demographics of the area. You will also need to have your real estate developer give you car count information for each location so you know what level of traffic to expect. The key is to NOT fall in love with any location. The location has got to be right. Your location is the cornerstone of your success. How much competition do you have in a given area? What types of car washes are they operating? How aggressive is your competition having to market (radio, billboards, flyers, mailers, etc.). Do they have lots of business all through-out the day? What kind of business model are they using (coin op, subscription, etc.). What locations are the in? What are they using for signage? What is the general appearance of their car wash (run-down, modern, glass, neon)? What are their business hours (waking hours, or 24-hours)? Different areas of the country are finicky about car washes. Certain states have very strict rules about water and power. You need to investigate the needed licenses and insurance requirements. You’ll need to choose a business entity name and research it to make sure that it’s available. Don’t rush through this preliminary phase – really take the time to get to the know the local regulatory landscape. This step is crucial to your success. Local planning officials have the ultimate say on whether you can or cannot build and open your car wash. Their job as the gatekeepers is to keep out the riff-raff and encourage the quality businesses. Each city planning department has a different culture that you have to get to know. Some cities/towns are too small to have full-time employees – this is important because when you submit a car wash design, you need to be aware that it can take a while for them to respond. Be patient. Setting up initial meetings with the city is a great way to get off on the right footing. Find out what their little quirks are. Each location within the city may have different building style requirements. The Automatic Car Wash system has just less than half of the United States car wash market. Generally, the customer drives his/her vehicle into the car wash bay, stops and the equipment ‘rolls over’ the vehicle. There are three different varieties: Friction, Touchless / Touch-Free, Hybrid. Tunnel car washes use a conveyor system to move the customer’s vehicle through the car wash bay. There are 5 different variations of tunnel car wash systems: Express Exterior, Flex Serve, Full Service, Hybrid, and Mini-Tunnel. Self-Serve car washes are for do-it-yourselfers. It’s essential a coin-op setup with the owner pulls his vehicle into the wash bay, deposits money into a vending machine (some are now converting to credit card) and a wash brush is activated with soap. The customer washes his/her vehicle with the brush and rinses it with a separate wand. Each of these car wash styles has their place in the market. Take some time to consider your preferred business model. Are you someone who doesn’t want to deal with customers very often – a self-serve might be best for you. Do you want to keep your staffing overhead to a minimum, then a self-serve is great. Do you want make your money on volume, then you’ll have to pick a wash system that has fast through-put. Do you want to add up-sell services, like detailing? Do you want to offer a monthly membership where customers pay a certain amount per month and get unlimited washes? Once you know what kind of car wash business model fits your personal style, you need to match that model to the demographics that you are trying to reach. Not all car washes are equal. For example, self-serve car washes are great for lower-income areas or near apartment complexes where people don’t have the ability to wash their cars in the driveway. You need to take the step and make an official business plan. This is crucial for raising venture capital or applying for loans. A business plan will help bring your dreams to a reality. You’ll need to run the numbers. You’ll need to know who your potential customers are, what their demographic characteristics are and how to reach them. You’ll to establish a preliminary budget to make sure that understand the profitability and cash flow. A business plan will be your guide map, and if don’t correctly, will keep you on course from making bad business decisions. Are you self-funded? Are you needing to attracted venture capital? Are you needing to take out a bank loan? Car washes come in all shapes and sizes and have a wide variety of price points. You’ll need to have completed your business plan and revenue and expense modelling. Whoever is lending you the money is going to want to know that you’ve done your homework. Car washes have hundreds / thousands of moving parts and down-time is costly. The parts are expensive and the lost revenue is painful. Don’t be penny wise and pound foolish. You want to shop for value – great equipment at a reasonable price. You want to price out service contracts with different vendors – you are going to require service from time-to-time. However, focus on preventative maintenance – keeping your equipment from breaking down in the first place. Schedule your service for after hours whenever possible. It’s a great idea to visit a car wash show where you can meet a lot of different vendors in one place. Take the time to get to know their equipment and do your homework. Ask different car wash owners what equipment they recommend and why. You are going to need a team of people to get your car wash facility built. Architect, Civil Engineer, Car Wash Designer/Builder (like Shinn Buildings), Car Wash Equipment provider, etc. The quality of the team makes a big deal in keeping your stress levels down. Hire good people. They will guide you through the process. The architect will help you city regulations and code compliance issues. The civil engineer will help you figure out what a chosen site is going to need – soil conditions, etc. 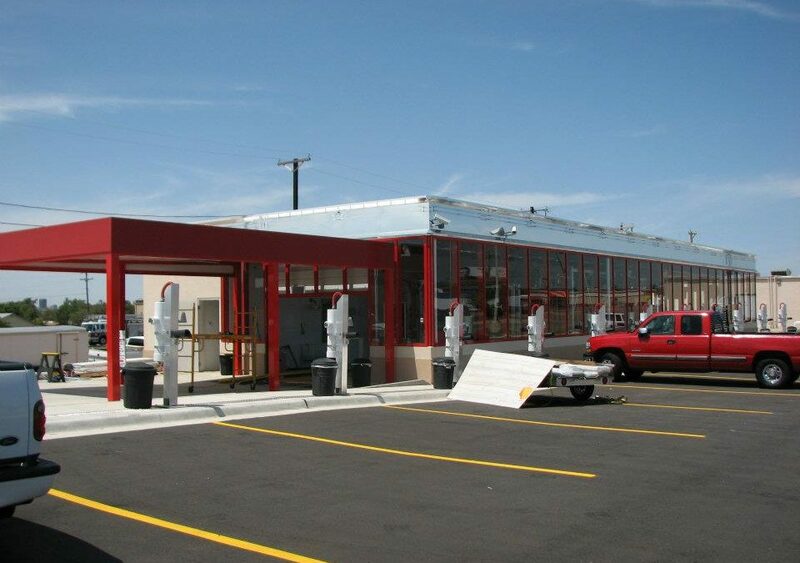 We, at Shinn Buildings will help you design your car wash as we work with you and your car wash equipment provider. This is really a team effort because of the number of moving parts. Expect your build-out to take about 6-months from the time you purchase you property. You have to allow time for plans to be drawn, having the city approve the plans (plans rarely sail through without the city changing something), plan revisions, permitting, etc. The building portion is a fairly straight-forward process once the foundation is poured. If you have any questions, please give us a call of fill out our contact form.